Randy Owen, Mark Herndon (standing), Teddy Gentry and Jeff Cook. 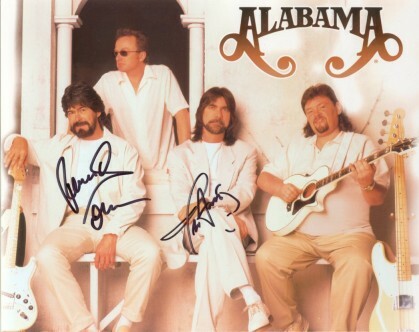 On Friday October 6th,'00 after a very long time in the wating I got to attend my very first Alabama concert. It was held in Little Rock, this was only like my third time to even be in Little Rock but oh well. We had a very long trip to make so we left at noon to be there by 7:30 we made it with about 30 min to spare, or so we thought. Alabama didn't get on stage until later than seven thirty but they were well worth the wait and in true country boy style they wore jeans and t-shirts. I just Love that! so I made the background of this page to resemble them. This was my first big concert, by big I mean actually held at a coliseum :o) They were great and it made my first concert something I'll always remember, up until that point. We had tried our Best to get back stage passes but couldn't. I still managed to get Randy Owen's autograph though by sending my picture (above) in with a lady that was allowed to go back stage. Then after the concert we walked around the building to see their bus and get a picture of it too and then what to my wondering eyes should appear... Teddy Gentry!! He walked right up to me and signed my picture we talked briefly and I told him Thank You (this thank you came straight from my heart!) and he hugged me! Teddy was the only one to come out and see those of us not fortunate enough to get back stage passes. Thanks Teddy! for making a long time fan's unthinkable dreams come true. I of course had bought shirts and hats and a little bear with a Alabama t-shirt on and because of Teddy's kindness I named the bear after him... Teddy :o) Not for teddy bear mind you but for Teddy Gentry! As the bus pulled away he opened the window and waved goodbye. This! was truly an experience I'll always treasure!